Whether preparing dinner or filleting fish for commercial reasons, having the right filleting gear with you is always important. 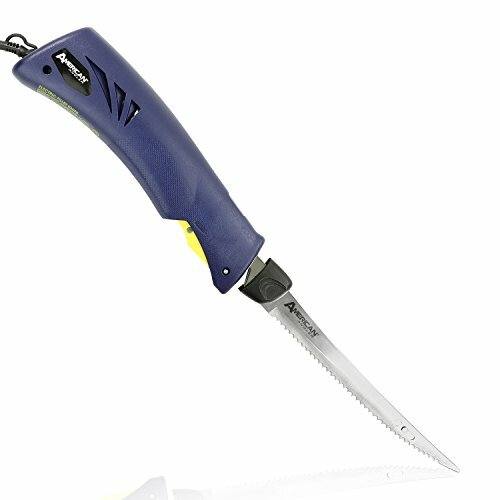 One particular piece of equipment that shouldn't miss out on your toolbox is a filleting knife. One thing you need to know about filleting is that it's a highly demanding task. Therefore, if you don't want to get your hands tired, invest in a well-made electric filleting knife. But before anything, you want to make sure that the knife you go for meets a few simple requirements. With all that in mind, we'd like to proceed to present you with our run-down of the best electric-powered filleting knives. No matter your budget or preferences, the following comparison table has something for you. Note that, for a detailed review, you can always dig deeper using the write-ups further below. 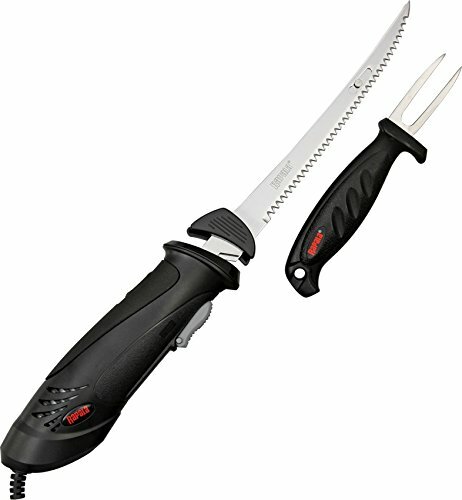 The Rapala-Heavy Duty is a mid-priced electric fillet knife. The knife is made from durable materials and is ideal for filleting small to medium-sized fish. Further, the Rapala has a heavy duty motor that has three times more power than standard electric fillet knives. The motor operates quietly and doesn’t (interestingly) heat up. Though the knife is corded, it has a long 8-inch cord for a smoother, unlimited operation. What's more? Being a medium-sized knife makes it a convenient bet for anyone who constantly experiments with large-sized and small-sized fish. Besides that, the knife is easily operated with an on/off button - a big plus for anyone looking for extra safety. The electric knife has 7 1/2 inch blades and uses reciprocating blades. You can buy the size of blades that suit you. Also, the blades are dishwasher safe. A cool motor that runs quietly. 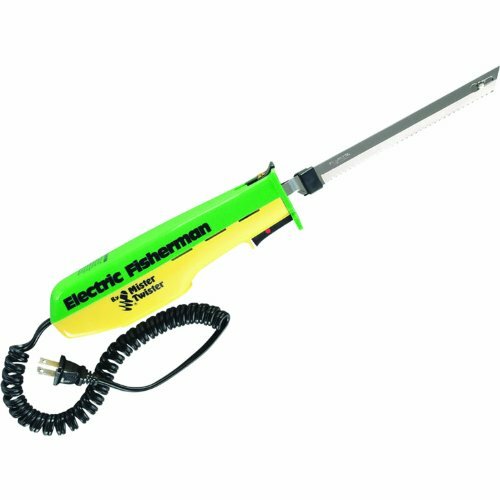 American Angler-Professional electric knife is designed for performance. The motor, handle, and blades are specially designed for professional filleting. It is designed for durability with an estimated lifespan of about four times more than other heavy-duty electric fillet knives. The heavy-duty motor operates at 110 voltages and is designed with two times more power than other standard electric knives. Besides that, the knife is fitted with an 8-foot polarized cord, which is long enough to prevent tangling inconveniences. The unit comes with five different sharp blades that can handle about any type of fish. The blade system is also compatible with other replacement blades. In addition, it has a non-slip handle designed with an advanced airflow system to keep it cool when the electric unit is running for many hours. Though the knife is quite expensive compared to others in the market, it is backed by the manufacturer’s two-year warranty. 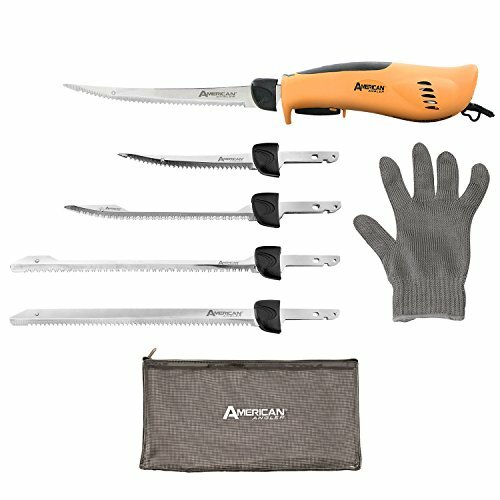 American Angler-Classic Heavy duty knife combines durability, performance, and power in one knife. It features a motor with 1.5X more power than other heavy-duty brands. In addition, the knife is designed to have two times more lifespan than other heavy-duty electric fillet knives. The motor uses 110 volts, and the knife has a heavy-duty polarized, 8-foot cord. Besides, the electric fillet knife comes with an advanced airflow system to keep the handle cool when in operation and therefore it never heats up. The blade system is compatible with all American Angler Replacement blades. Therefore you can fit any blade type or size that suits your filleting needs. 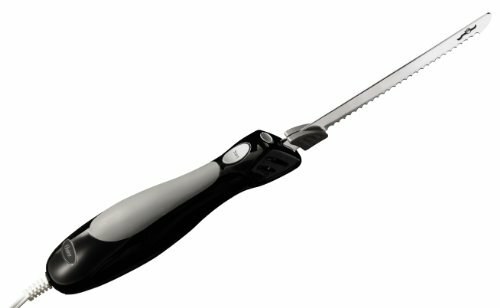 Mister Twister is a lightweight electric knife powered by 120 voltages. The motor is fitted with heavy-duty gears and bearings. It is quite an affordable knife that comes with a high powered motor and therefore cutting anything with the knife is quite a breeze with little effort from the knife operator. The knife also comes with a sharp blade that cuts with precision, cutting straight with no jagged edges. The knife’s blade system is designed to fit either a 7.5-inches or 9-inches long blades only. The knife is long lasting, and the blades last a long time. Unfortunately, the blades cannot be sharpened and have to be replaced if they get dull. Good enough, replacement blades come at a very affordable price. In addition, the knife has a safety lock to prevent the motor from being switched on accidentally when not in use. The blades cannot be sharpened. They have to be replaced. 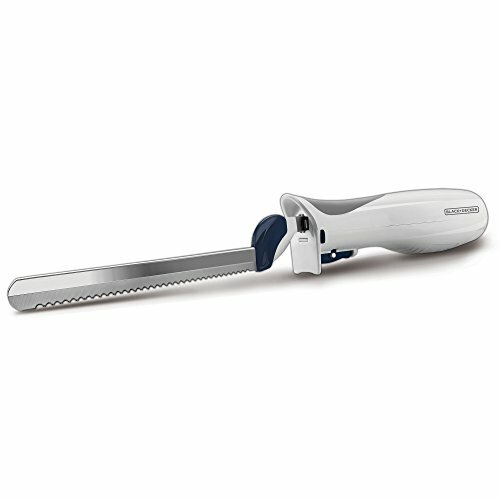 Cuisinart CEK 40 is a knife constructed with a powerful motor for quick and easy filleting and cutting of various meats. It has an ergonomic handle that can be operated well by both left and right-hand users. The knives are easy to operate with a one-touch on and off button. In addition, they have stainless steel blades. Cuisinart CEK 40 blades are high-quality stainless steel BPA free blades. An order comes with two blades. One is a bread blade while the other is a carving blade. You also receive a wood block storage tray for the convenience of storing the knife. The knife operates using a 4-foot cord. It also has a safety lock. There are two other knives in the same series with slightly different features from the Cuisinart CEK 40. 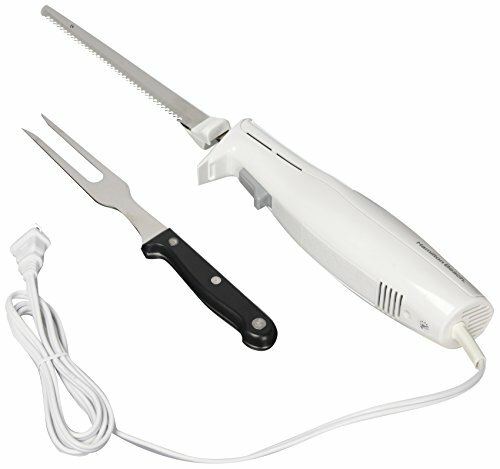 The Corded electric knife-CEK 30, is the most affordable. It has a 5-foot cord and comes with a removable blade that is very sharp and dishwasher safe. Then the Cordless electric knife-CEK 50 is the most expensive of the three. It is a rechargeable unit with 20 minutes battery run time and a half an hour charge time. It comes with two blades, serrated and straight-edge. Hamilton Beach Electric Knife 74250 is a budget-friendly, versatile knife that cuts effortlessly. Apart from cutting fish fillets, it is also used for cutting thick or thin slices of cheese, bread, turkey, ham, roast beef among other foods. 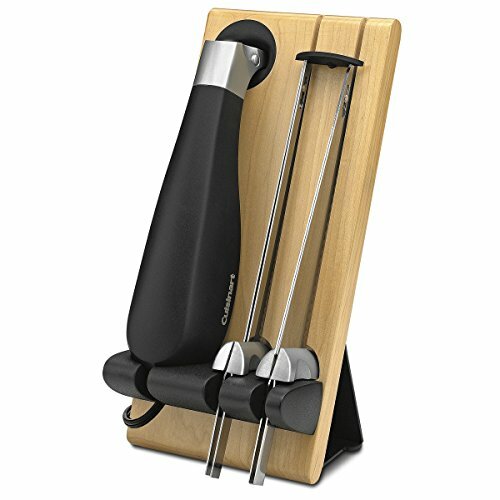 The package includes a carving fork that assists in cutting and serving plus a storage case. It is a 100 watts machine. The knife comes with a sharp, stainless steel medium-sized blades for precision cutting. In addition, it has an ergonomic handle for comfortable operation. It is an easy-to-maintain unit. The 7.5-inch blade requires no sharpening. The fork is dishwasher safe, while the blades should be washed in hot and soapy water. The blade is easily disassembled from the handle for easy cleaning. 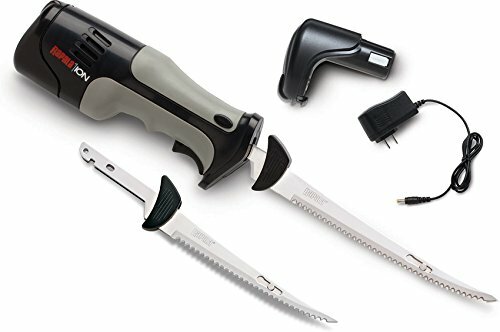 Black & Decker White is a mid-priced, multipurpose knife that can be used for filleting or cutting thick and thin slices of fish, meat, bread, and other foods. The knife is made to last and easy to maintain. The knife comes with a 9-inch stainless steel partly serrated(7 ½”) blade for quick and even cutting. Besides, it has a non-slip handle that is comfortable and puts you in control of your cutting. In addition, the knife has a safety lock to prevent accidental turn-ons. The blades are easily removed through pressing the blade release button and can be hand-washed or put in the dishwasher. There are two models to choose from, black and white. The black version is much more affordable than the white knife. Rapala Cordless Fillet knife is a powerful knife that cuts through fillet with so much ease. Though the knife is not cheap, it comes with the convenience of being a cordless unit. It is constructed with a high powered motor that has an airflow system to eliminate vibrations and noises. The rechargeable, lithium-ion batteries feature a low memory effect to prolong the battery running time. On a full charge, the battery can run for one hour and 20 minutes. The battery takes about 2 hours to get fully charged. The knife has serrated 7-inch stainless steel blades. Though the blades cannot be sharpened, they are easy to remove, and it is quite convenient to find replacement blades. Besides that, the electric knife comes with an easy to grip handle for your comfort. An order includes the knife, rechargeable batteries, wall charger, and an EVA padded storage case. The blades cannot be sharpened, they have to be replaced if they get dull. Oster Electric Corded Knife is a budget-friendly multipurpose electric knife that cuts easily through fillets, poultry meats among other foods. A package comes with a knife, storage case and fork all of which have a sleek design. The knife comes with some ergonomic features. It has a non-slip handle that is comfortable to hold. In addition, it has an easy to operate on/off button that is on top of the knife. Besides that, the knife has a strong, detachable, sharp, 8-inch blade that is stainless steel. The blade is designed with a tip for carving tough meats. The blade is removable for easy cleaning. The fork and storage cases are provided for your convenience. The fork can be used for either handling meats when they are being cut or already cooked and being sliced to be served. The storage case, on the other hand, is provided for easy storage of the fork and knife when not in use. Rapala REF-AC Corded fillet knife features a knife and a stainless steel fork that make a great combination in the kitchen. The knife is constructed with a high powered, quiet operating motor that uses 110 volts. The power is enough for filleting small and medium-sized fish. In addition, the knife has an advanced airflow design which prevents overheating when it is operated for long. The knife comes with a 7-foot long cord for your convenience. Besides, it comes with a 7 1/2 inches long, sharp and stainless steel blade. Further, the knife has a 6''long handle, also ergonomically constructed for comfort when working with it. The fork is strong and durable with a stainless steel prong construction. You can use the fork to hold fillets while cutting or when your cooked meats need a fork for holding it while cutting before serving. After analyzing the latest list of the leading fillet knives that are powered by electric motors, we'd like to give you some specifics. Yup, we'd like to present you with a detailed buying guide to help you make an informed choice. It's only a powerful knife that will help you cut through any fish no matter how bony or fleshy it is. Basically, you're best prepared if you have a highly powerful knife. The last thing you want is to get caught up with a huge fish but a less-than-stellar knife lets you down. In our experience, the best blade is one that's made from stainless steel. And with so many blade varieties available, you're better off going for the safest bet. In that case, we'd recommend settling for a thick, strong, and serrated blade. As you know, electric knives are powered by an electric current and, therefore your safety is of utmost importance. In that regard, always ensure that the knife you settle for meets the basic safety standards. Most importantly, it should come with a safety lock feature along with a grippy handle. The kind of cord your knife comes with matters a lot. Go for a weak cord and you're likely to have it damaged even before the rest of the knife gives in to pressure. So, we'd generally recommend settling for an all-around knife. That is, besides it having a good motor and strong blade, it should at least have a high-quality electric cord as well. A sheath is an important safety and storage feature of any knife. However, very few knives come with it. So, it'd be a great advantage for you to find a knife that comes with one. As for the sharpening stones, if you can find a knife that comes with one, then you should consider going for it. Otherwise, you'd need to buy a sharpener separately and at an additional cost. We'd certainly go for the Mister Twister 120V electric knife and that's because it's affordable and well-made. It spots a bunch of safety features along with a highly accurate blade release. Otherwise, the first runner's up position would deservedly go to the Rapala HD Electric Fillet Knife. That's because it has a pretty powerful motor and well-made dishwasher-safe blades. Nothing beats the level of happiness that fresh fish brings to the family. 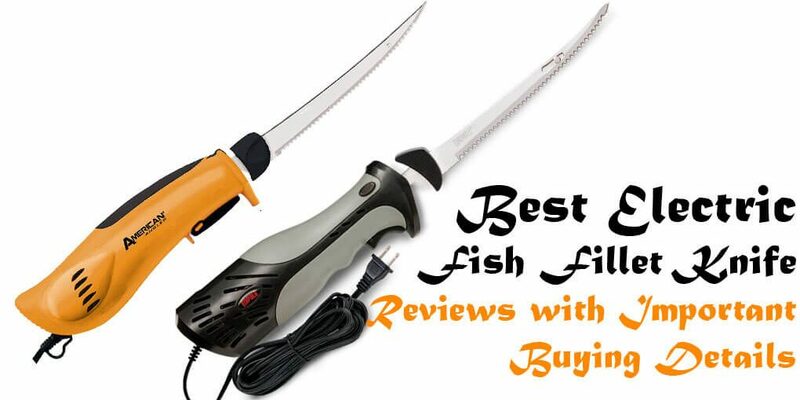 Indeed, only the best electric filleting knives would help you achieve this coveted experience. And it's our hope that the review above will help you make just the right choice.